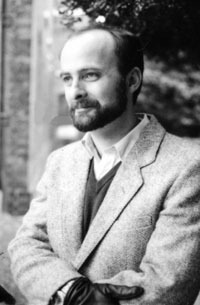 Author and scientist David Brin is best known for his Uplift series, the novels in which humans must help chimpanzees and dolphins reach full sentience so that humans can in turn be made full galactic citizens. Also notable is his 1985 novel The Postman. Made into the motion picture of the same name by actor/director Kevin Costner (1989), The Postman also holds the distinction of having won the Hugo, the Nebula, and the John W. Campbell Awards, as well as a commendation from the American Library Association. No stranger to such distinctions, Brin has also received the Nebula, the Hugo, and Locus Awards Startide Rising, and his Uplift War garnered the Hugo and Locus Awards as well as a Nebula nomination. Brin was voted favorite writer of the 1980s by the readers of Locus magazine. While such achievements might seem quite sufficient for any author, Brin also holds a BS in Astronomy, an MS in Electrical Engineering, and a Ph.D in Space Physics. He once worked as a Research Engineer for Hughes Aircraft Research Labs, and was an Associate/Postdoctoral Fellow at the California Space Institute at UCSD. In addition to teaching Physics and Writing, he has served in various scholarly capacities at the Center for Study of Evolution of Life (UCLA) and at NASA's Jet Propulsion Laboratory and NSCORT for Exobiology. His scientific papers, in both popular and professional journals, cover an astonishing array of topics from astronautics, astronomy, and optics, to alternative dispute resolution and the role of neoteny in human evolution. An outspoken advocate on the need for individual freedom and responsibility, as well as on matters ecological, Brin has lectured worldwide on these and other topics and contributed to numerous online zines and print publications. In 1998 he published The Transparent Society: Will Technology Force Us to Choose Between Freedom and Privacy? The book, strictly non-fiction, deals with a broad range of threats and opportunities created by the information age, and emphasizes the value of the freedom of information. The work was awarded the Freedom of Speech Prize from the American Library Association. Brin's concern for the future has also led him to develop a new series of novels for young people (the Out of Time series) which encourages a lifetime habit of reading while fostering such values as courage and rational problem solving. Other creative projects have included the authoring of two novels set in the universe of Isaac Asimov's Foundation trilogy, and the co-development of the computer games Ecco the Dolphin (1998) and Tribes (done with Steve Jackson Games, 1998). His Uplift series have inspired the role playing game GURPS Uplift (also by Steve Jackson Games). David Brin lives in San Diego county with his wife and fellow scientist Cheryl Brigham, their three children, and "a hundred very demanding trees". He currently serves on governmental and non-governmental advisory committees dealing with the future of the information age. His novels have been translated into twenty languages. Hugo 1985 Best Short Story, for "The Crystal Spheres"